We have now entered 2018 and are looking to reach new heights and do new things. One among those new things could be adding some colour to the interiors of your home. If your day of spring cleaning is coming up soon, you also might want to consider adding a bit of colour to your home this year. Fresh new hues will add more beauty and life to your house and works even better than just a spring cleaning. However, the question of what colours to use still lingers. 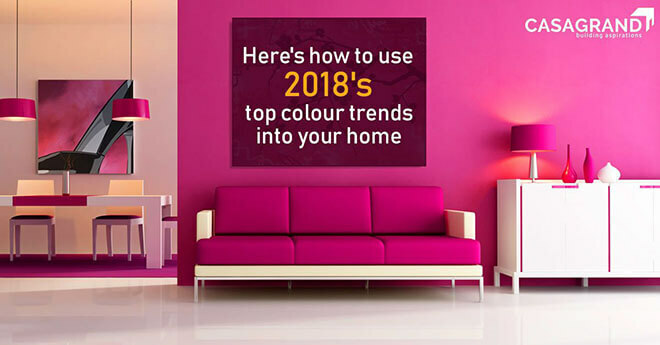 We have come up with a list of colour trends for 2018 that are guaranteed to make the interiors of your home look more lively and classy. Scroll down to know more. Pink has seen a rise in popularity in 2017 and is sure to become even more popular in 2018. Soft, subtle shades of pink can make your home look elegant and can blend easily with most other colours. Consider getting blush pink or dusty rose shades for your furniture and cushions to give your home an instant makeover. These shades will definitely be a good addition to your space and will add the right amount of elegance and grace. Last year, ultraviolet was named as the colour of the year. This edgy shade of purple was dedicated to the legendary singer, Prince, in the wake of his untimely demise. That being said, it is best to opt for rich dark hues of purple to add a touch of luxury and opulence to your home. However, be sure to use the colour only in small amounts to make it work with the existing colour palette. This shade works best when scattered amidst a neutral coloured backdrop. Purple cushions or rugs would be perfect for the job and will add the right amount of sophistication to your home. Add hints of mettalic colours to uplift your neutral palette. The best one for the job is the heavenly hue of bronze. If you are looking for a mix that says edgy yet sophisticated, heavy shades of bronze would be just right for you. Bronze light fixtures are the easiest and safest way to rock this trend and add oodles of drama to your space. Natural colours that give you the feel of a forest create an atmosphere of cosiness and warmth. If you are looking to bring an outdoor feel to your interiors, shades of green – forest green, in particular – is your best bet. Paint your walls dark green, use forest green carpets or add forest green fabric to one piece of furniture to get the right effect. You can also opt for fresh indoor plants for a soul-stirring ambience. A unique mix of grey and beige, this shade is possibly one of the best neutral shades ever created. 2017 witnessed a rise in the popularity of neutral palettes and the contemporary shade of greige is the clear winner. You can add this colour to your walls to get the ultimate neutral palette for your interiors. This shade works with all lighting and blends with most other colours, making it ideal for all types of indoor spaces. If you are looking for cost-effective ways to spruce up your interiors, you can check out some DIY tips to upgrade the look and feel of your home. You can also check out our detailed blog on the top kitchen designs for your new home for some inspiration. These are some of the top colour trends of 2018 along with some ways to use them in your home. Now that you have a guide on how to add these colours to your home, it’s time to go and implement them to make your home look chic and sophisticated. Head out to Casagrand today for top-notch properties at stunning locations and make your home a heavenly abode.